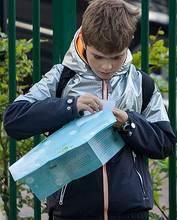 In the Netherlands 28,233 children were walking and cycling for 'Groene Voetstappen' and handed them over to their local aldermen in September and October. 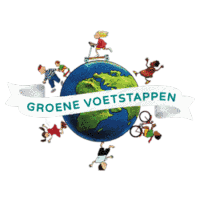 193.688 Green Footprints as well as many 'Gouden Voettstappen' for extra actions like saving water, planting trees, being a flexitarian or organizing a local climate summit. 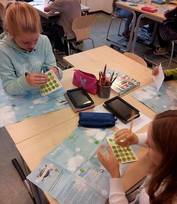 After a successful kick off in Vleuten, municipality Utrecht, children in dozens of cities and towns in the Netherlands collected stickers in the redesigned stickeralbums. 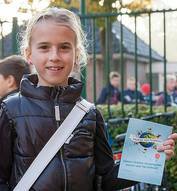 As in previous years they also had a national Kinderklimaattop, this year on 6 November. It took place in a totally sustainable building in Dordrecht. Two children from each participating municipality were invited as delegates. Some 60 children from across the country presented and discussed their ideas to combat climate change with several adults, e.g. the UN Youth Delegate Max van Deursen, Michel Rentenaar, Climate Envoy Netherlands and Anna Schoemakers, director of Klimaatverbond. "With exercise, running and swinging on the playground you can generate energy. We also want to save rainwater from the schoolyards and plant trees or bushes.."
So the 'Golden Tip' the children handed over to the Dutch climate delegation for the UN Climate Summit in Paris is an 'energetic schoolyard' equipted with swings, seesaws and other pieces of playground equipment that generate energy when using them - what a wonderfull idea! Another nice idea was to levy taxes for all products that still emit CO2. On 28th November, when the climate train will ride to Paris, ten ZOOMers from the Netherlands together with Petra Lettink and Matty van Leijenhorst from Klimaatverbond Nederland will be in the train until Brussels to discuss with the other people on the train.